Thanks to those of you who post comments on Connectedness. It's nice to hear from you all. Yesterday Tiffster posted a thoughtful rebuttal to my post, warning of card-collectors and other dubious contacts, seconded by Valdis. I emphatically agree with tiffster's comments, btw. But it seems that the real point of my orginal post didn't make it across. Here's another way I can say it: Have you ever looked at a screenful of 2nd and 3rd degree contacts on LinkedIn and wondered, which of my personal friends connects me to each of these targets? Just as tiffster says, not all introductions are equal. And for that very reason, I find it annoying that LinkedIn won't reveal the introducer's identity (who is one of my personal friends, after all) until I delve specifically into one target's profile. From that scenario it is one more step to contemplate aggregated reports, which is what I suggested yesterday. Though I am on record as a social software skeptic, I am also both (1) a fan of SNA, and (2) stubborn and methodical as hell. So here's what I discovered today. I had just finished assembling a long list of target firms--80 corporations I would love to be introduced to. What to do next? Believe it or not, I spent two whole days concocting strategies to turn this list into real live contacts before it occured to me, "What the hell, why don't I try LinkedIn." So I went and typed each of my 80 target companies into LinkedIn, one by one. Only twice did I find a useful introduction; far more often I was three degrees or more from my goal--not so useful. Rats! As I trudged through this rather tedious business, one truly interesting thing emerged. I kept seeing the same couple contacts again and again. I had discovered the "boundary spanners" who connect my world to the universe of my 80 target companies. Suddenly I knew that instead of focusing on getting introduced to each of my 80 target companies, I should go learn from these boundary spanners and open my horizons to opportunties I couldn't even begin to list. Well, that's classic networking; but I had never thought of using LinkedIn quite like that until I just stumbled into it. And once I did stumble into it, LinkedIn helped me identify a few boundary spanners that I probably would not have guessed by myself. Now can you guys (you know who you are) please go and automate this process? Here's what you need to do: Give me an option so when I say "Link me to industry sector X" I can see either (1) individual introductions to sector X, listed in order of degrees removed, or (2) a list of all my contacts, showing the relative frequency with which each of them connects me to the universe of sector X accounts on LinkedIn. If I am connected to someone linked to ten different people in sector X, I want to know! This is the stuff from which partnerships are born. As they say, "Give a man a fish and he eats for a day; but teach a man to fish and he eats for a lifetime." To that I add, "Introduce a man to a fisherman and he can eat for a lifetime without ever having to catch a fish." Yum! For those of you hesitant to try crack or crystal meth, I just discovered an equally addictive pastime you might consider. 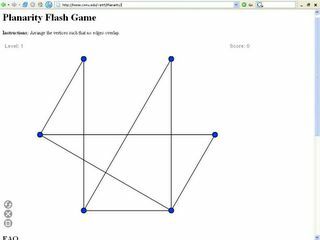 The "Planarity Flash Game" presents a network on-screen and invites you to reposition the nodes so that there are no crossing edges. For example, can you see how to uncross the edges in the following network? In fact, you can uncross all the edges in the above network just by moving the "9-oclock" node up and to the right. After you uncross all the edges in one network, the game presents you another, more difficult network. If you like networks, it's hard to stop! Thanks to Eszter on SOCNET for sharing this. BTW, playing this game will give you a lot more appreciation for the complexities of network visualization. I learned a few lessons in blogging the other day, while comparing notes with Mal Watlington. Mal and I are co-presenting a "Battle of the Blogs" next week at the Mass Bay Organizational Development Learning Group (ODLG). I'm looking forward to our presentation. Blogs are one of those things that seem more high tech than they really are, especially to a decidedly tech-averse group like ODLG. Mal and I hope to demystify blogs while sharing our experience of how they are useful to professionals in general and OD consultants in particular. Talking with Mal, I discovered that I am a fairly low-tech blogger. I go about my day, and much of what I share in Connectedness I learn about in old-fashioned ways like talking with people and reading articles. In a typical day I do not read a single blog, although I do rely on the Internet heavily and consider myself a brown-belt Googlemeister. Meanwhile, uber-bloggers like Robert Scoble manage to "read" 1,000 blogs a day, thanks largely to ever more sophisticated aggregator technology. Moreso than aggregators, I'd list search engines and social bookmarks as the top gee-whiz assistants to my personal information gathering. Recently I commented on OutFoxed as a nice tool that integrates both searching and social bookmarking, by re-ordering my google results according to feedback from my network of trusted informers. Just yesterday this network-assisted search unexpectedly turned up a living overview of social bookmarks maintained on the community blog ConsultantCommons. Then I looked at myself with an ironic smirk: Funny how we so easily get caught up in feeding technology upon itself. Thanks to Peter Gloor for pointing me a while ago to "Who Knows Whom, and Who Knows What," an article about business to business SNA in June's CIO Magazine. "It's not 'doing SNA' to a group of people, it's developing work habits that embrace creating and sustaining networks of relationships and managing them responsibly; SNA is just a diagnostic that often helps stimulate the thinking around the change. But the real changes are in work habits and work practices, in understanding how people accomplish their work, the roles of other people in that accomplishment, and moving that work to a higher level." Many others have also commented on this article in the weeks since its publication, including Visible Path and MeshForum. So far I haven't seen anyone else mention my most favorite part of the article, which is a link to Rob Cross's Personal Social Network Action Plan. It puts SNA data in the context of what one individual can do to be more effective in her work, and it reads like a thoughtful reply to Patti's comment, quoted above. The Economist also noted the competent jerks and lovable fools I mentioned in my last post. In the same article they include a great quote on the SNA craze, "re-evaluating jolly types who spend long hours hanging around water coolers is currently fashionable," before segueing neatly to Ron Burt. See "The Jerk at Work: Wise Enough to Play the Fool?" Suppose you need help completing a project at work. You can ask Alice, who is professionally expert but personally prickly; or you can ask Brenda, who is very likable but doesn't know much that can help you. When faced with that hypothetical question, most people choose the competence of Alice over the likability of Brenda. Did you choose similarly? Researchers have found that the real story is more complicated. When faced with a real-life choice, most people ignore their stated preference for competence and actually choose likability first. Ideally, of course, we wouldn't have to choose between competence and likability. We'd work exclusively with people who are both. These are the "lovable stars"---highly sought after folks in short supply. Once the "lovable stars" are all taken, we must then choose between the "competent jerks" and the "lovable fools." Or when desperation strikes and all we need is another warm body, it may be time to recruit from the pool of "incompetent jerks." 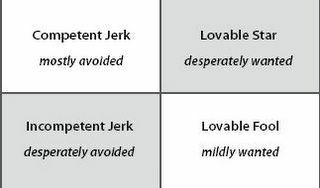 The authors describe a three-pronged approach to managing the tradeoffs of competent jerks and lovable fools: (1) manufacture liking, (2) leverage the likable, and (3) reform the jerks. Under leveraging the likable, the authors describe how lovable fools can help organizations in the role of "affective hub." Joe Labianca (Professor of Organization & Management at Emory University) once told me a perfect story of an affective hub. A client of his was about to fire someone who was seemingly incompetent and/or lazy, until Joe's social network analysis revealed that this person was very much liked by and connected to every corner of the organization. So instead of firing him, the managers recognized this lovable fool as a key resource in winning widespread support for their new initiatives. Their ability to promote sustainable change improved dramatically as a result. Wow! Thanks to my friend Todd Harris for the tip on this, and I also recommend you see Patti Anklam's post on this same article, as well as this nice review by Four Groups. Taking a step back from this article, I'd say one thing that makes it so catchy is its use of "jerks" and "fools." The authors deliberately contradict the SNA tradition of focusing just on positive relationships, with dramatic effect. Once again, this reminds me of Joe Labianca. He has been doing groundbreaking research in balancing the social network ledger by including negative relationships as much as positive relationships. As he explains in this thoughtful paper, negative relationships have received far too little attention. In fact, Joe suggests that negative relationships are more critical than positive ones in affecting key organizational attributes like performance. Joe is certainly not the only one uncovering the dynamics of positive and negative social networks. Rob Cross and others have been doing related work on energy in organizations. But this post is too long already, so I'm going to save that discussion for later. 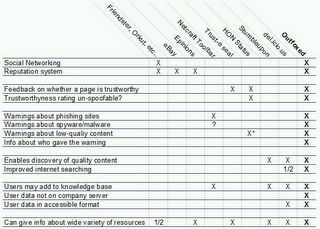 To that list I would like to add (4) information gathering. This is an application close to my own heart. In fact, with the benefit of hindsight, information gathering (aka learning) has been the main motivation of my networking over the past year. Networking in this way depends on cultivating diverse personal contacts and tapping into increasingly powerful web-driven forums. When I think about how it all comes together I feel like the focal point of a high-gain "business applications of SNA" antenna, with this very blog as my primary output channel. Both of these links connect to communal definitions of what's hot in business SNA, according to those of us who rate, tag, categorize, or otherwise publicly annotate the web pages we see. Come on and join the Outfoxed party! It's a free download that works as a plug-in to the wonderful open-source Firefox browser. It works best if someone invites you to join. Feel free to email me and I'll invite you into my Outfoxed network. It's that magical time of year again, when the Tour de France captures the hearts and minds of two-wheel fans across the globe. Today Lance Armstrong wasted no time crushing his main rivals in the first of twenty-one stages. Please, before Lance makes it look too easy, can someone give us some drama? You can keep up with the Tour minute by minute with the fantastic coverage provided by CyclingNews. I tripped over this interesting post by John Hagel: "Process networks in medical research," in which he describes the Myelin Repair Foundation (MRF). Former Silicon Valley CEO Scott Johnson founded MRF several years after being diagnosed himself with multiple sclerosis. Basically, he discovered that if he wanted an effective treatment in his lifetime, he would have to make it happen himself. "In February 2002 [Mr. Johnson] attended a research conference in Ventura, Calif., on myelin. While Mr. Johnson found the studies presented in formal sessions interesting, he hit paydirt chatting up the scientists in hallways and at the bar of the Ventura Beach Hotel. If you had to choose just a handful of scientists to receive funding for research on MS, he asked about 30 of them, whom would you pick? The names of the same five scientists came up again and again. "Mr. Johnson invited the quintet to a meeting over Memorial Day weekend 2002. In the boardroom of Silicon Valley Bank in Santa Clara, Calif., he presented his vision. Repairing myelin, he said, is a "finite and definable" goal for MS therapy. He was prepared to raise significant sums for such research, but there was one condition. "Mr. Johnson had come to realize that scientists typically keep their discoveries secret for years, the time it takes to methodically repeat an experiment to make sure the results are sound, write up a description of the methods and results, submit the manuscript to a scientific journal, wait for it to be critiqued, make the requested revisions, resubmit it, and wait some more until the journal publishes it. In the kind of research he was prepared to bankroll, the scientists had to agree to work as a team to develop and execute a coordinated research plan. Anyone who made a discovery had to share it with the other four labs right away." Very cool! Though Hagel refers to this as a "process network," I encourage those of you intrigued by this approach to look up "production network" as well. The Barr Foundation in particular is doing a lot of great work under that name, which is quite similar to MRF. You can find more community-minded production network ideas here, which includes a reference to the relevant Center for Advancement of Collaborative Strategies in Health (CACSH). Perhaps we could get the folks working on health information liquidity to introduce these two foundations to each other? Imagine accelerating medical research not just by coordinating labs but also by providing those labs with huge archives of (properly secured) health records.